I could’ve listened to Phil’s rant all night :) And got the feeling he’d still be going strong come dawn. Delivered from his hospital bed, not very long after the second surgery on his troublesome infected foot. Hilary Barry loses it after the Campbell news item and has to leave the desk for a while during the bulletin. That's what this guy means to the people he works with. Ooh, there's an earlier longer version of said rant (complete with hospital background noise). Insult piled upon insult. Mike Hosking as Broadcaster of the Year! What the hell has happened to this country? Leopoldo Méndez, Mariana Yampolsky. 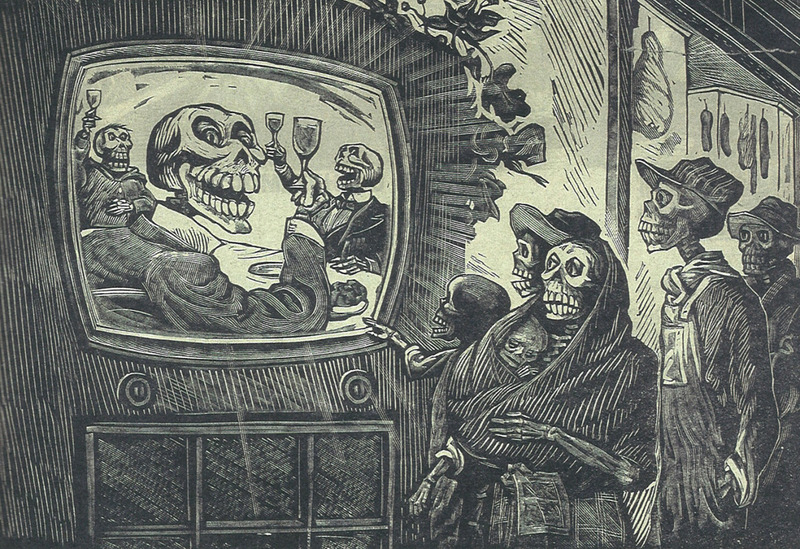 Calaveras Televisiosas Todo por un Hoyito. 1949. The NZ Radio Awards have basically become an excuse for Big Radio to say nice things about itself. And I had a look on the NZRA web site and there's no identification of the judges, only an "academy of judges comprising of both past and present broadcasters within New Zealand and overseas". Totally agree about RNZ afternoons being a sleepzone - be great to get Campbell in there to shake it up. The decent into Fascism all around the world makes people who speak truth to power all the more important. As much as I respect John Campbell, he's no Chris Hedges (who I rate as the most important Western journalist writing on Fascism today) and the fact that Campbell Live's loss is felt so deeply only shows the paucity of real journalism here in NZ. I'd say it's more like illiberal democracy such as what you get in Singapore, than Fascism with a capital F. There haven't been any pogroms or death squads in the streets just yet. Looks like I will be switching my tv off even earlier now. I already don't watch much tv. People don't watch tv3 from 7:30pm onwards because it is utter nonsense, with brainless garbage. Geoff, I'm picking that if Mike Hosking's politics agreed with you, you'd agree with his Broadcaster of the Year award. Stop confusing politics for talent. Our tiny television market suffers from a dearth of intelligent local programming, and the demise of Campbell Live has hastened our main broadcasters' insane race to occupy the bottom of the programming barrel. I've recorded and watched the show five nights a week for years -- I'm a "regular viewer". But I don't have a peoplemeter, so I don't figure in Julie Christie's world. Thanks to the team for treating us to a damn good nightly fix of current affairs reporting -- it's one we're not likely to get anywhere else, anytime soon. John Oliver once a week is good, but it doesn't fill the same gap. Geoff, I’m picking that if Mike Hosking’s politics agreed with you, you’d agree with his Broadcaster of the Year award. Stop confusing politics for talent. Should you ever develop the skill of reading Geoff Lealand's postings without moving your lips it might dawn on even you that you've picked it wrong. The lack of courage in your own convictions that reduces you to sniping from behind a lame pseudonym ensures that won't happen anytime soon. For me the really sad part of this is how predictable it all was. As soon as people like Mark Weldon and Julie Christie get a role in any organization you will see this kind of decision making. They are people with connections, they get invited to the right meetings, they know people in power. They have no knowledge or talent of their own yet are utterly convinced that their decisions are always right. They firmly believe there is nothing they do not know and no decision they make is ever wrong. They do not need facts or data or input from anyone with knowledge. Should anyone ever prove them wrong they will respond with hatred and stubborn dedication to their chosen course regardless of the outcome. In New Zealand we revere these people until we throw them in jail. But only after they have destroyed far too many good things. There haven't been any pogroms or death squads in the streets just yet. Well there seem to be quite a few in Israel and Ukraine to mention just two. If we take Fascism to be a merging of Corporate and Government power (Fascism should more appropriately be called Corporatism because it is a merger of state and corporate power- Benito Mussolini) then that is precisely where we are all heading. Couple that with a controlled media and a spying system that would have given Stasi bosses wet dreams and it's a bleak outlook. If I take your point that there are no pogroms/death squads in New Zealand then yes, of course not - we are very easily controllable and would rather die in bed than stand up for ourselves. The losses started with the decision of former MediaWorks receivers Korda Mentha - in 2013 when they were receivers for the company - to turn down an offer for a long term contract for the Australian soap opera Home & Away, because the commitment was too long. The loss of the show - which delivered a big young audience to 3 News -is blamed for a big fall in ratings for 3 News in 2014 and 2015. Home & Away was later picked up by Television New Zealand. The receivership happened, as noted, because of the debt loaded onto Mediaworks by Ironbridge. And, because receivers are receivers and not executives, there was nobody with a mandate to think in the long term about retaining 3 News' vital lead-in programme. A lot of problems since stem from that simple fact. It also happened because we have lax company (and broadcasting) laws that allow a company to dump its obligations and rise from the ashes with the "owners" recovering control of the business. As opposed to it being shut down and the license re-tendered for. Echoing many of the points already made in thse posts, Martin van Beynen in the Press chimes in with this: John Campbell TV3 departure: He's no different to a can of soup. Van Beynen admires the man Campbell but is no great fan of Campbell Live. The article headline is made without any sense of irony - at least in terms of a nod to history. A job in the art world surely beckons for JC if not in the the media... a NZ outlet for Campbell's soup perhaps?! To add to the insult was to hear the hypocritical Key say that he really rated John Campbell and was very sorry to see him go. Yeah right!. I am sure that that nice Mr Key used a proxy knife to cut JC's belt off him.